"I would be remiss if I didn't bring it up with every client." "Not bringing it up is negligent and setting clients up for financial catastrophe." "It's too big of a risk to ignore in the planning process." "It could blow up their entire retirement plan." "It is my fiduciary responsibility to have every client prepare for this possibility." "My clients don't need it." "It's too hard to sell." "I'm uncomfortable engaging in the long-term care conversation." "It's not worth my time." To have a convincing conversation about how to protect clients' retirement assets from long-term care risk, you first need to believe that a long-term care plan is a critical component of their financial plans. Most advisors plan well for the inevitable death of a client, but it's just as important to plan for old age. Without a long-term care plan, a client risks significant financial loss due to health care costs. Keep in mind that all of your clients already have a long-term care plan in place: in the absence of a long-term care insurance (LTCI) policy, their plan is to spend their own income on long-term care expenses, which, for some, may make sense. In the absence of an insurance policy, however, you need to counsel your clients on the least damaging way to reallocate their income to cover long-term care expenses. You might think that your clients' biggest concern is running out of money, but a 2013 Merrill Lynch retirement study revealed some surprising responses to the questions, "What is your number-one retirement worry?" and "What are your top financial worries for retirement?" Topping the lists were "serious health problems" and "health care expenses." Ironically, although your clients may not want to discuss this topic, their health and the related expenses are of great concern to them. 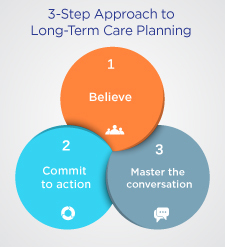 Your belief in the value of a long-term care plan can help your clients understand the disconnect between their concerns and their reluctance to plan for these arguably inevitable costs. "What would you recommend if this client were your mother or father?" "Could this client benefit from a long-term care plan?" "What would be the consequences to the client's family and finances in the absence of a plan?" "Is this a risk your client is willing to take?" Believing in the need to protect your clients' families and finances will lead to action. Meaningful action is the result of following belief with commitment. Commit to speak with every client over 50 years old one time each year; then, follow through with an appointment dedicated to the long-term care discussion. If the client doesn't want to meet, don't give up. Bring it up every year until he or she is uninsurable or passes away. Sometimes, clients who previously expressed a lack of interest suddenly want to talk, usually because someone they know and love has had a serious change in health. Commit to sending communications to clients to let them know that you can assist with these planning needs. Although Long-Term Care Awareness Month comes officially in November of each year, you can still take advantage of resources from the American Association of Long-Term Care Insurance to help promote your insurance capabilities. Every day, I hear from advisors whose clients have presented them with a long-term care proposal from another agent or advisor. In some cases, a client has recently purchased a policy elsewhere and wants the advisor's opinion on it. Your commitment to ensuring that clients are aware of your service offering can help avoid these situations and keep assets with your firm. "Is it reasonable to think that, if you live to 85 or 95, you may become ill or frail and need long-term care services?" "What is your plan for that care?" "How will you pay for it?" Sometimes, when an advisor brings up this topic, the client rejects the idea outright and the advisor acquiesces. If you believe that this is a risky strategy, don't let the client off the hook. Instead, help him or her understand the consequences of not having a plan. Their income is significantly diminished as they grow older? They have to spend thousands of dollars a month, indefinitely, on uncovered health care expenses? Plans to leave money to loved ones are altered by events that might have been foreseen? Looking at the situation from a different perspective can sometimes lead clients to change their mind about the importance of having a plan in place. The insurance process can be challenging, what with numerous applications, paramedical exams, attending physician statements, and a lengthy underwriting process. That's not to mention a host of solutions to choose from, including traditional LTCI, linked-benefit products, and life insurance with long-term care riders. But with belief, commitment, and mastery over this critical conversation, you can have meaningful interactions that lead to successful insurance cases for your clients. How do you protect clients' retirement assets from long-term care risk? Are they receptive to the long-term care discussion? Share your comments below.